There may have been a false note in tonight's season finale. I mean, fun as it was to see the Space God from "Godfellas" pop up at the beginning, I'm not sure his intro was really necessary. And I suppose if you somehow managed to miss every single reference to classic cartoons, early video games, and Japanimation, you might not have enjoyed the episode as much as you could have. But then, if you missed every reference, I can't imagine why you would have stuck with the show this long in the first place. Because holy crap, that was so, so, so much fun. I'm not even sure how I can properly review it. Futurama has done triptych episodes before. There were a couple "Anthology of Interest" episodes, and maybe something else I'm forgetting. But it's never been this playful with its form before, paying homage to trio of different styles without missing a beat or coming across as self-indulgent. Really, with this kind of experimentation, the only way to make it work is to embrace it whole-heartedly. Which "Reincarnation" does, passionately and thoroughly. After the barest explanation of what's about to happen (the Space God speech, which, again, isn't really necessary, but it was funny), the episode just goes for broke, and it's a marvel to watch. Oh sure, there's no real sentiment here, but if we can get something this consistently inventive, this entertaining and engaged, I can live without sentiment. Plus, the characters stayed true enough to themselves that this never came across as a cheap stunt. The writers and animators knew what they were going for, and the end result is great synthesis of their passion and grasp of esoteric styles. Really, I'm at a loss at how to review this. "It was great" is on the short side, but I lack the knowledge to note down every reference and in-joke the episode made. This was just exactly what it needed to be and a terrific way to close out what has been, by and large, a pretty lukewarm season, enjoyable enough but with a certain unavoidable sense of creative exhaustion throughout. This is one of the reasons "Reincarnation" was such a delight; you could tell everyone involved was fully-engaged, and in the later seasons, that's becoming less and less of a certainty. Really, so many of my problems with the last 13 episodes are how programmed so many of them feel, as through the writers remember the motions of good storytelling but are no longer capable of the content required to make those stories worth telling. It was especially telling near the end of the season, when the show started going for the heartfelt sweet spot that helped make it so well-loved by fans in the first place. "Tip Of The Zoidberg" was solid, but "Cold Warriors" and "Overclocked" were disjointed (the latter much more than the former). Their dramatic moments were compelling enough on their own, but in the context of the rest of the episode, they came off as forced and manipulative. Futurama can and should be manipulative from time to time, but it can't let us know what's going on until it's too late for us to distance ourselves, and neither "Warriors" nor "Overclocked" really accomplished this. Thankfully, "Reincarnation" was much more satisfying. All three stories centered around a certain comet made of diamondium, which anyone who's been paying attention to science news lately, or just reading "Weird stuff!" stories on Yahoo realizes is probably a reference to a recently discovered diamond planet. (Actually, the timing here is very tight. 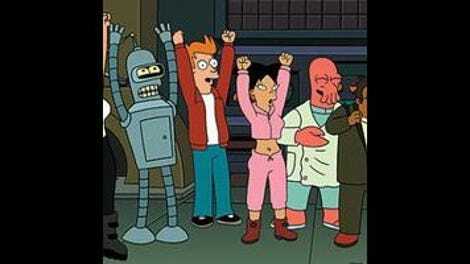 Either news of the diamond planet has been going around scientific back circles for a long time, and the Futurama team happened to get wind of it, or else this is an incredibly happy coincidence.) 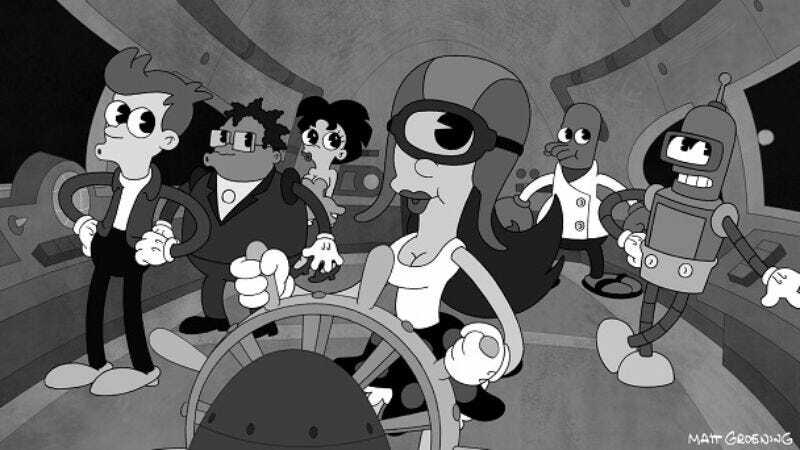 The first story, done in the style of old school black and white cartoons, has Fry trying to use the diamond to woo Leela. He succeeds, but then he and Leela get sealed in the diamond and wind up on an engagement ring for a pair of aliens one billion years down the line. In the second story, done in the style of old school video games, Dr. Farnsworth uses a piece of the diamond to create a lens capable of seeing the very smallest particle in the universe. This allows him to solve the Grand Unified Theory, which in turn makes him depressed because there are no more questions to ask. But that itself raises some questions, and he realizes life goes on. And in the final story, done in the style of old school anime, a group of dancing aliens, offended by the destruction of the diamond comet, attack Earth. Only Zoidberg can master the dance of peace needed to save the day. Which of these three stories is the "best" is probably even more a matter of taste than usual. The middle one was my favorite. The story seemed the strongest to me, and more importantly, I know more about old school video games than either of the other forms used. But while the first story is maybe a little shallow… Nah, I can't even finish that sentence. This all worked, and I wouldn't be very surprised if it winds up considered one of the best episodes of the show's entire run. The jokes range from obvious (the terrific bad translations in the Japanimation) to the slightly more obscure (like the shift in background animation in the first story when Fry's exploring the diamondium comet), and nearly all of them land. I'm not sure if this is a sign of the show's creators becoming more engaged with their work or if it's the last creative gasp of a series that's on the downhill slope, but that's not really important right now. What is important is that this was a joy to watch, and I already want to watch it again. "Have you tried to get her pregnant?" "Gosh, yes, I've tried and tried!" "I gotta go check the comet for anarchists." "Is my eye playing trick on me?" "Blorg, blorg, a thousand times blorg!" "Leela, shh, I'm trying to listen to a physics lecture!" "There's a snail on the tail of the frog on the log that I found at the bottom of the sea!" "It's a mirror into Scruffy's soul." Stephen Hawking guest appearance! I appreciate the occasional reminder that he isn't dead. "I watch TV. It's the next best thing to being alive." "Ha ha. I will slice them on my morning fish porridge!" "I see your mother the water mutant didn't raise any fools, Turanga Leela." "The list of things I've heard now includes everything." "I'm puzzled, for we don't know what mouths are." "I fear our only option is thrilling space battle." "You and I are enemies now." "Zoidberg stop! We're too ashamed right now to enjoy the ceremony of your death." And that about does it for now. It's been real-ish!